These are the cookies that Christy remembers us making from her childhood. I think what she remembers most is the way that I crushed the peppermint candy cane. I usually bought one of the large peppermint sticks, put it into a double layered plastic bag, went out in the driveway, and ran over it with the car. I still remember them all standing on the porch watching to let me know if I had hit it or not. I would run over it backwards and forwards and then get out to check it. If it needed a little more crushing, I’d keep doing that until it was a fine powder. Now I realize that I could have just hit it with a hammer but the kids enjoyed it more with the car method. I always tried to do things unexpected to surprise them. With kids, it doesn’t take a lot! Just any little thing out of the ordinary. When I poured the milk over the kid’s cereal in the morning, they always waved their hand over the bowl. Most mornings I would wait and tell them to move their hand or no milk. Well, one morning I just went ahead and poured the milk over their little hands. They still talk about their surprise at me doing that to this day. Not much mess, but lasting memories. Sometimes the day to day chores become ordinary and it is up to us to add in the little unexpected surprises. I think it gives the day a little lift and puts a smile in our hearts. And who knows, it may just become one of the cherished memories of our children’s childhoods. My message today is to never take life too seriously and always remember to take the time to make a few memories along the way. Now let’s make these cookies. 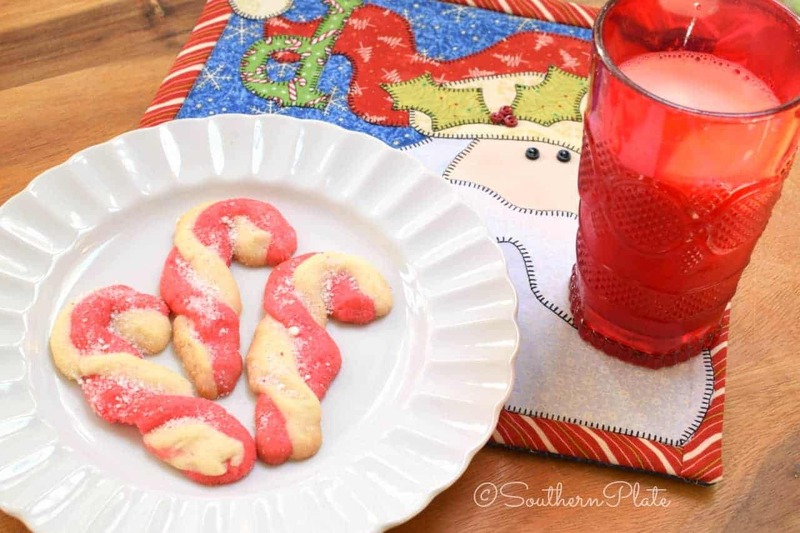 This is a classic recipe that has stood the test of time and you may be surprised to find that these cookies are a special favorite of Santa’s elves! See the bottom of my post for proof :). Our cast of characters for today are: Butter, Shortening, Sugar, Egg, Vanilla, Peppermint Extract, All-Purpose Flour, Salt, Candy Canes, and Red Food Coloring. Now that is an all-star cast! Cream butter, shortening and 1 cup of sugar until light and fluffy. 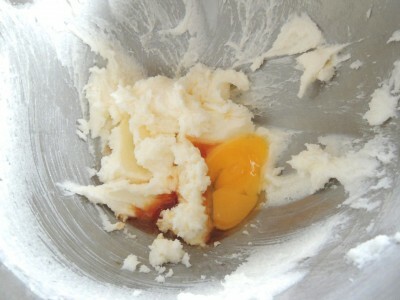 Add egg, vanilla and peppermint extract. Mix. 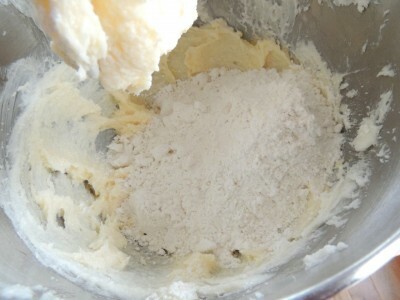 Stir flour and salt into batter mixture and combine well. 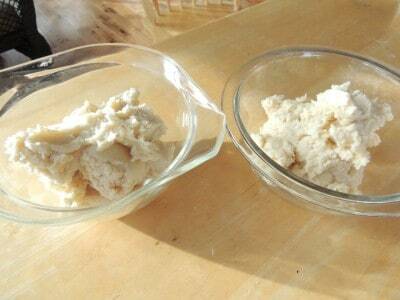 Divide in dough in half into two bowls. Stir red food coloring into dough in one of the bowls. 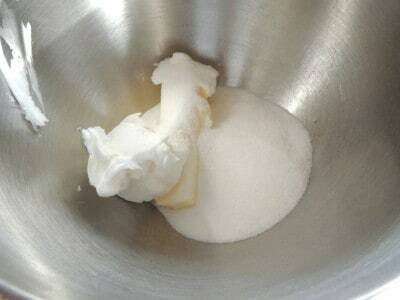 Scoop dough into one teaspoon portions. Roll dough into ropes about 4 inches long. Place two ropes side by side, press lightly together and twist into candy cane shape with curved top. Place onto ungreased cookie sheets and bake at 375 degrees for 8 to 10 minutes or until very lightly browned. While still warm, sprinkle with crushed candy cane and sugar mixture. 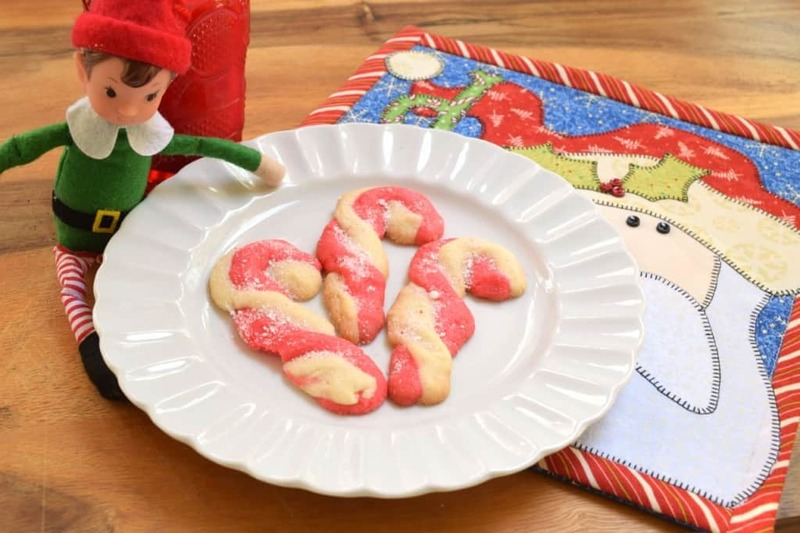 If you have any elves in your house this holiday season, you’ll probably notice these cookies disappearing faster than you had expected. I bake countless varieties of cookies all year around but especially during the Christmas season. I’ve never known any cookies to be as irresistible to elves as these are. I can make a batch of these, each of us only have one or two, and wake to find the jar empty the next day with my elves bellies looking slightly plumper than the night before. Clearly, these are a favorite among Santa’s helpers, and Santa, too! 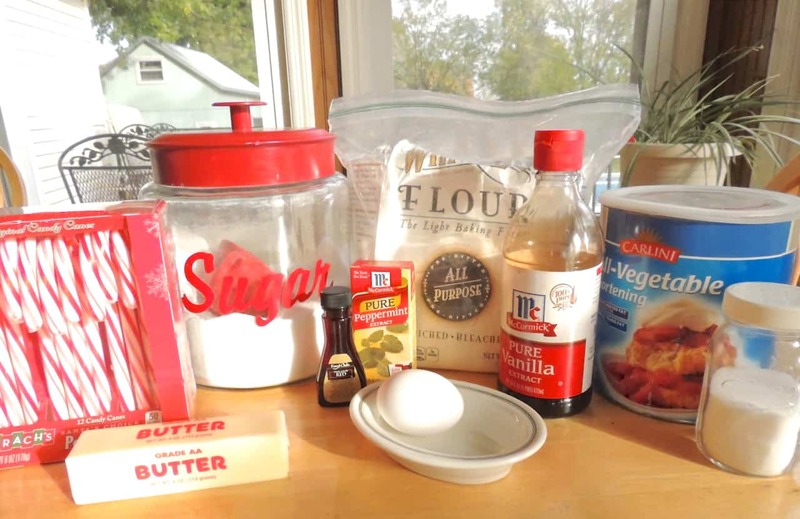 In a large mixing bowl, cream butter, shortening, and 1 cup sugar until light and fluffy. Add egg, vanilla and peppermint extract. Stir flour and salt into butter mixture and beat until well combined. 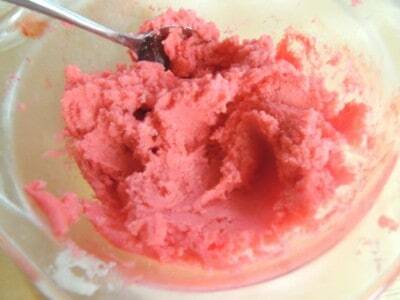 Stir red food coloring into one half of dough until well blended. 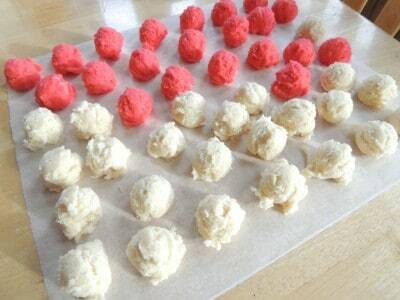 Roll 1 teaspoonful of each color dough into four inch rope. Place 2 ropes side by side, press lightly together and twist. Place on ungreased cookie sheets and curve top for the handle of the candy cane. 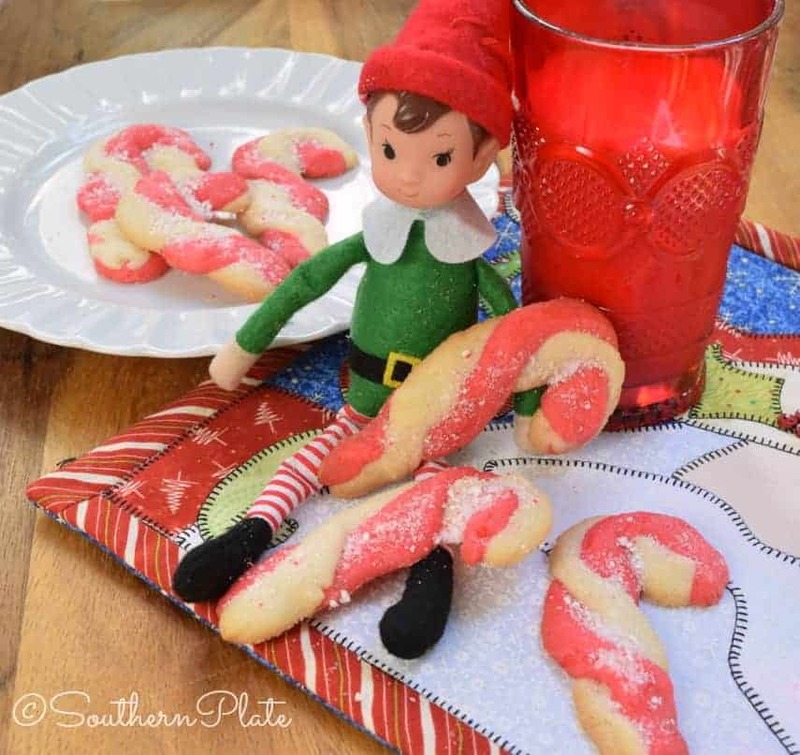 While cookies are baking, crush candy canes to equal 1/2 cup mixture and add 1/2 cup sugar. While still warm, sprinkle with topping mixture. The warm cookie will cause the topping to slightly melt enough to adhere to candy cane. Wonderful! Nothing better than good ole Christmas cookies! May the family have a Merry Christmas!! These are sooo cute! I love all your posts. Can I please come make cookies with you?! My daughter just started the Elf on the Shelf with her 4 year old. She’s working today so I’m making a batch for her to pick up on the way home. She’ll put them out tonight with ‘Buttons’. Thanks for the recipe and idea! Great idea. I used to make these for my children when they were small. I think I’ll make them for my grandkids. Thanks for the reminder. It’s funny that you just posted these cookies. My mom used to make these cookies when I was a kid. Well now that I’m the grown up, I searched through all my cook books looking for this stupid mystery candy cane cookie…like it was a magic cookie or something, ok at Christmas for me…they were..I can’t explain it, I loved them. Come on candy canes and cookies…mmm, mmm. So a few weeks ago, I asked my mom about the recipe, and she just laughed at me and said it’s just the sugar cookie recipe with food coloring and peppermint, and I rolled them in crushed candy canes when they were done. Well, you could of hit me with a feather, this made my mom hystical, because she always tells everyone that I’m the cook in the family, not her…mind you this has been driving me crazy for years…I mean years, but I was determined to figure it out on my own…yeah…that didn’t happen. LOL! Silly me… She did tell me sometimes she would get lazy and leave out the peppermint and just roll them in crushed candy canes and they were just as good Well, lesson learned, now I know. At least I gave her a good laugh and she knows that I tjought her cookies were special and she thought they were just silly little cookies she tossed together and were no big deal. So if anyone doesn’t think that kids don’t remember little things, trust me they do…I still remember those silly little cookies and how they tasted. I have no idea what I got for Christmas…any of those years…but I remember the cookies! Such a cute idea for cookies! Thanks Christy! Hi Fran ! YUP !! This recipe will work well without the peppermint flavoring and crushed candy. I’ve done it that way, from time to time. If you like almond flavoring, that can be substituted for the peppermint. Or, just up the vanilla instead. They will still be a yummy addition to your Christmas cookie platter. Have a wonderful Christmas ! Yes, that would work Fran!! That is the cutest elf I have seen! He is adorable. Would love to find one like him. If only I knew where to look….??? I can just picture your mom running back and forth over the peppermint candy. Her neighbors must have thought she was crazy!! What a fun memory! We always had a lot of fun growing up Judy, Mama has always made life about enjoying the moment! I loved today’s post and will agree with all of my hear that the unexpected moments are the best memories. My momma was the best at doing unexpected things and at times would get so tickled at the mischief she was about to do that she gave herself away before getting it done. My how I miss that little, round, mischievous woman. Oops that was supposed to be HEART not hear. My thoughts ramble faster than my fingers type. I bet she was so fun to be around!! Love the story, and the way to crush the candy canes, wouldn’t work here, they’d get lost in the snow on the drive. Our favorite! I started making these 40 years ago from my old Betty Crocker Cookbook. I never use peppermint extract. However, I always make the peppermint sugar to sprinkle on. Fun! I like your idea of a 1 tsp scooper. I finally gave up on the one teaspoon idea and just made long ropes about the thickness you would get from the 1 tsp of dough then cut them to size. That was priceless! Crushing candy canes with the car! Why haven’t I thought of that? I know my 3 yr old grandson would be tickled to pieces if I were to try that! Love your humor and your outlook on life….and the recipes aren’t too bad either! Merry Christmas to you and your family.